This is adorable...love the tiny ribbon bow. This is a fantastic card Becky! Love the popped up little ducky! that is so adorable those ducks are fabulous... great job!! 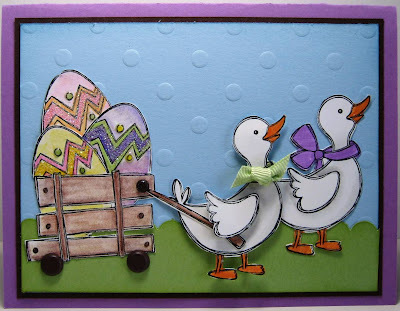 Love the ducks pulling the wagon - really cute idea executed brilliantly!!! How cute! Love the duck's dimension and how the brads make the little wagon pop to life. And LOVE the glitter on those cute, colored eggs! I love this card... I haven't been too totally into this stamp set, but you have definitely made me take another look. Totally cute! I love this stamp set. I am a demo from Georgia and I appreictae your inspiration!